Brooke Burke wore the perfect summer outfit, white denim and a colorful top, to the launch of the Baby Buggy for Havaianas collection at The London West Hollywood Hampton Court. Love her fresh and colorful look? We have rounded up similar items so you can copy her chic mom style. Brooke Burke always looks polished and stylish when she is on-the-go with her kids (Neriah, 11, Sierra, 9, Rain, 5, and Shaya, 3), often opting for denim paired with a stylish blouse and boots or heels. When she is on the red carpet or on air for DWTS, the busy mom wears designer gowns and high-priced jewels. Although most of us don't have her budget for fancy designer gowns, you can definitely steal this casual, yet cool, look that is perfect for summer. White denim is a fresh and fun look for summer -- especially when paired with a brightly colored top, as Brooke did. If you love designer denim, you will adore the white stretch denim of the Rag & Bone bootcut jeans ($165) from Nordstrom. For a look that is equally as chic for a fraction of the price, check out the STS Blue Getaway flare leg jeans in white ($35) from Nordstrom. Pair a bold colored top to add a pop of color to your look, such as this Essential ruffled cami ($11) from Forever 21. Colorblock tops are a huge trend this season and look fab paired with white denim. 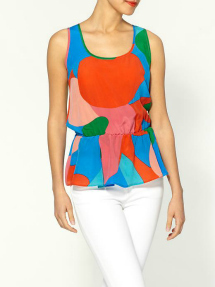 One great option is the Abstract peplum tank ($59) from Piperlime. 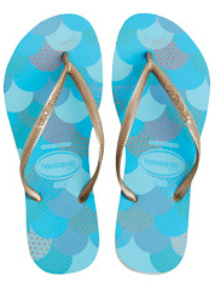 Brooke pairs her look with colorful Havaianas Baby Buggy flip flops ($26), which were designed by celebrity moms including Courtney Cox and Tori Spelling. You could also pair this look with brown wedges for a more dressed-up look. The Magestee by Steve Madden wedge sandals ($69) are a versatile shoe that would go with a variety of colors, which means you can mix and match this season's bold looks without clashing with this shoe. Pull your hair back in a high ponytail and finish off your look with the it shade of the summer -- coral nail polish. We like Essie nail polish in Canyon Coral ($8) from Nordstrom.